By Erica Ater - founder of Deep Blue Notion, a handmade, earth friendly jewelry boutique based in Long Beach, California. You just can't deny the popularity of the bib necklace right now! Because they can be pretty expensive, I wanted to try and make one myself. With a good friend's birthday coming up, I had the perfect excuse. It's made almost entirely from materials I already had. In fact, the pink material came from an old blouse the birthday girl had given me years before to use as fabric because it was worn out and had a hole. The only aspects I had to buy were the sticky felt sheets. I found them at my local craft store for .79 cents a piece and they turned out to be pretty priceless in making this DIY project easy and mess free. They eliminated the need for fabric glue or a glue gun. I have to say, it turned out quite well and the birthday girl loved it! Today, I want to share with you how to make your very own bib necklace. This DIY project is easy, inexpensive and fun! So, gather your materials and follow along! 2.First we will figure out what shape we want the necklace to be. Big vs. small. Symmetrical vs. asymmetrical. Use some paper and try a few different shapes. Hold it up to yourself and look in the mirror to be sure it will look good on you. Once you have a shape you like, make a pattern with some sturdy cardboard. 3. Next we will work on the flowers. Below I will go over a few techniques to make fabric flowers. i.Cut a circle out of your fabric with a diameter of approximately 3 inches. Knot your thread and sew around the perimeter of the circle. Once all the way around, do not knot your thread. Instead, pull tight so you have a little gathered pouch. Flatten your pouch to form a flower. Next, thread your needle through the center of the flower from the gathered side to the plain side and then back through again. Pull tight. Finish with a notion such as a button or bead. i.Cut a strip of fabric approximately 3/4 inches wide and 34 inches in length, longer or shorter depending on the desired size of your flower. Sew the length of your strip of fabric staying close to one side. Once you reach the end, do not knot. Instead, gather the fabric down towards your beginning knot and form a flower. Secure the two ends of the strip together and add your notions. i.Cut out several circles from your fabric. They should range in size and shape. Stack them and sew them together. Add your notions. 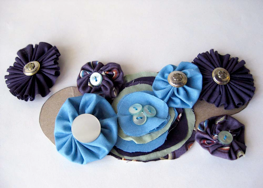 4.As you make your flowers arrange them on your cardboard pattern to get the visual of how your necklace will look. Adjust the size and shape of your flowers to fit. 5.Next, use your cardboard pattern to cut out your shape in both of your sticky felt sheets. Leave the paper on to protect the sticky side. 6.Sew your flowers on to one of the felt shapes. Start from the back which is the sticky side covered in paper so the knots are at the back. Then go back through once and knot again at the back. Keep your flowers close together so you won’t see the felt. Make and add more flowers if needed or trim your felt shape down a bit. 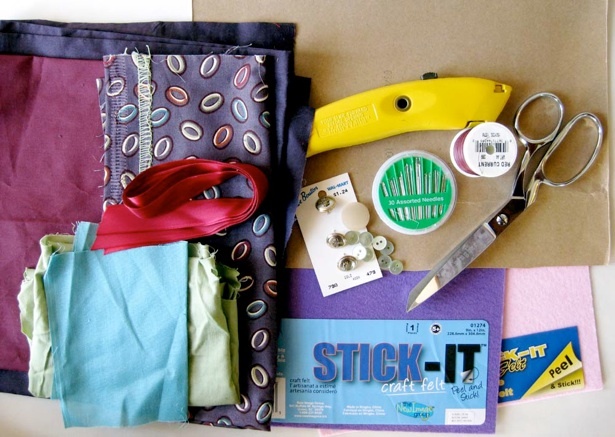 7.Decide where your ribbons should go and sew them in place. These will be tied together behind your neck giving great versatility in how the necklace is worn. 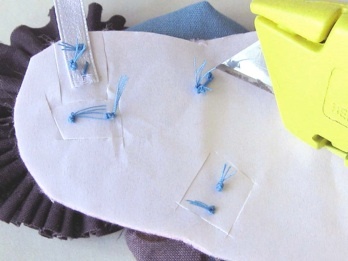 8.Use your X-Acto knife to carefully cut around the knots on the back of your felt. 9.Peel off the paper to expose the stickiness. Peel your other matching piece of felt and stick them together. Press firmly around the edges. Now you have a nice, neat back. 10.You are now finished! Here is how mine turned out. I hope you enjoyed the process and love your new earth-friendly bib necklace!We are giving away the necklace I just made! 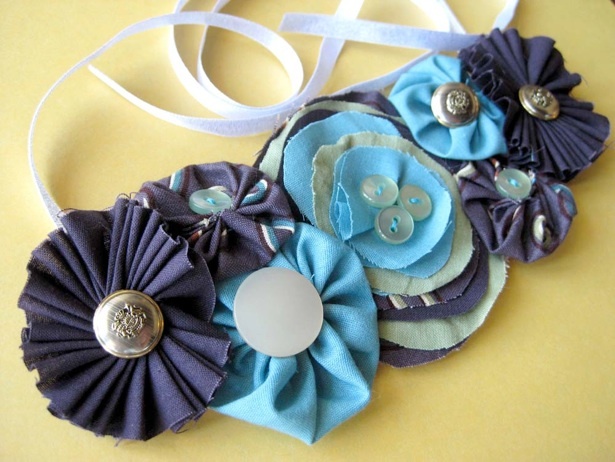 Do It Yourself Beautiful Bib Necklace! To celebrate our anniversary, we’re giving away this amazing necklace! To enter, email Amy@AmyKnowsBest.com and tell us a change you have made to reduce, reuse, and recycle!